The saying goes that if you aim for the stars, you just might end up on the moon. Every so often, though, you hit those damn stars, and South Korean filmmaker Bong Joon-ho is no stranger to that level of achievement. He's never done it quite like this, though. His sci-fi epic Snowpiercer is a cinematic accomplishment that barrels its way down the rails of success through intelligent and exciting storytelling, an execution in set and atmosphere that surpasses even the most epic of Hollywood blockbusters, and a slew of top-notch, talent delivering wholly unforgettable performances. 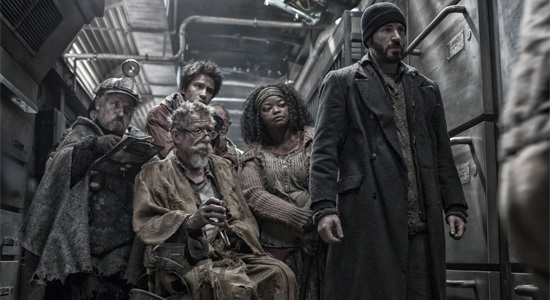 Snowpiercer is a masterpiece, rivalling even the best sci-fi in terms of scope and story, and that's saying nothing of its highly inventive conceit. Set 17 years after a global catastrophe has frozen every, living being on the planet, the survivors live their days on the Snowpiercer, a high-tech train that circumnavigates the Earth once every year. The train never stops, never slows down, and plows through any ice blockage that may build over time in its path. The train and its constant motion are all that's keeping those inside safe from the deadly elements on the outside. Unfortunately, life on the train isn't quite as it's cracked up to be. A class system has formed, those in the front part of the train serving as the upper class while those relegated to the tail section are lower than the low. Mistreated, crammed into tiny quarters, and only fed manufactured protein bars, the "tailies" are constantly at the ready for the next revolution, the next attempt at taking over the train and running it how they see fit. Naturally, those in charge will do anything in their sadistic power to keep that from happening. That isn't so much a synopsis for Snowpiercer as it is establishment for the setting. After a quick explanation as to what happened to the Earth (as well as an even quicker introduction to the concept of the train itself) Bong, who co-wrote the screenplay, an adaptation of the French graphic novel, "Le Transperceneige," with Kelly Masterson, thrusts the audience head-long into the day-to-day routine in the Snowpiercer's tail section. The characters are introduced without a hint of establishment, Chris Evans, Jamie Bell, and John Hurt making up the core of the latest tail-section uprising we're about to see. And yet, even without the exposition or development that would have most movies (especially most sci-fi blockbusters) slowing down to a snail's paces, there's no difficulty in following the actions of every character. On the contrary, Bong and Masterson present their story with incredible efficiency. Even with a running time of over two hours, every scene is important, every interaction is a development to some facet of the story, and the motivation that drives each character, no matter their size, is laid out. Multi-faceted as it is, Snowpiercer is a film that not only warrants multiple viewings, it demands it. There's absolutely nothing wrong with that, either, when the film is as entertaining and as roaringly exciting as this. Once the uprising is in full-swing, the action moves from traincar to traincar. The "tailies" fight their way through each one with whatever weapons they can get into their hands, constantly moving forward towards the front and the "mastermind" hidden behind that final door. Again, Bong is on fire in his execution of each and every action setpiece that progresses the story. What could have been offered up with tedious similarity is, instead, given a fresh coat of paint with each, new gauntlet thrown. The director is never satisfied with shooting action the same way twice, and each sequence becomes increasingly more charged than the previous, each doorway between cars revealing a new twist, a new turn, and a new step in both social and humanistic commentary. There's a history built in to every character on the train, whether it's revealed or not. Bong and Masterson reveal aspects to the train and its inhabitants that constantly rewrite how the preceeding 17 years are viewed. Sometimes these reveals are startling, other times funny. 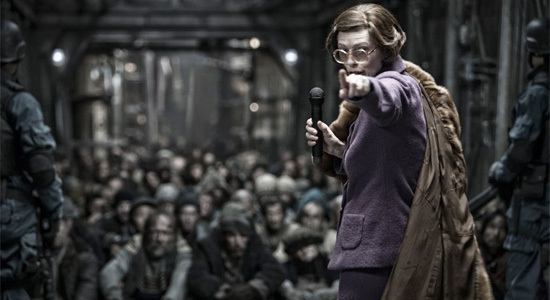 Snowpiercer, as violent as it is, does carry a heavy sense of humor, an aspect that blossoms up out of the turbulent fray to keep it all from every growing too dreadful. The film needs this, as darker developments and more disturbing reveals keep the very genuine drama alive throughout. So, too, do the performances, some of the best work we've seen from the amazing talent Bong has culled together. Evans always has strength as a courageous leader, his character here providing an abundance of dark history on which to draw. Bell and Hurt are also great, as are Octavia Spencer and Ewen Bremner as fellow tail-section revolutionaries. South Korean staple Song Kang-ho plays a front-section citizen aiding the revolution, Ko Ah-sung his character's daughter. On the other side of the morality coin, we find Tilda Swinton sporting rotten teeth and pushing a Yorkshire accent through them. As the mouthpiece for the film's ugly upper crust, she is superb, delivering ample bits of nasty dialogue with the utmost of energy. She's the highest point in a mountain range of great qualities, one whose every minute of screentime is a joy and whose absence is noticeable. Her performance alone is worth sitting through the film a few times. 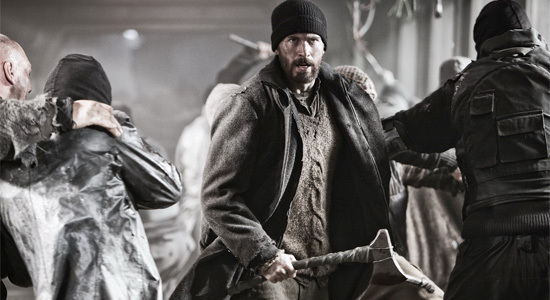 But, again, that's not much of a chore when the film is as remarkable and as full of brilliant moments as Snowpiercer. With a screenplay that works on a number of levels, it easily transcends its apocalyptic, Warriors-on-a-train formula. With films like Memories of Murder, The Host, and Mother already under his belt, Bong Joon-ho was already a powerful voice in the filmmaking world. With Snowpiercer, he's achieved the "masterpiece" status. For a filmmaker who is clearly aiming for the stars, he only needs to hit that level once. Fortunately for us, he's a filmmaker who will likely catch that lightning in a bottle again. "This is going to be good." said Mason moments before The Sacred Engine takes them into a rather long tunnel. And she was absolutely right. I wish I liked this as much as you did, but alas, I was only lukewarm on it. Yeah, Swinton was incredible. Is she good in everything she's in?! Yes. She is. She's better than Streep in my opinion. I thought the movie was decent. Why wasn't there much advertising for this film? Agreed. Giving Snowpiercer 10/10 and calling it a "masterpiece" reminds me of the time Empire Magazine reviewed "Attack Of The Clones" and gave it 5/5, along with the quote: "Yoda's astonishing, crowd-pleasing battle with Count Dooku. A showdown that is - inarguably - the Star Wars saga's greatest single moment". Totally agree. I think it's a "good old" Sci-Fi epic who can stand besides Alien or The Blade Runner. Thanks Jeremy. It was a solid 9 for me. The ending took it down a whole point. I was quite disappointed with this film. Great sets, amusing quirky characters, and interesting political satire. The class-divided carriages were an interesting set-up, while Tilda Swinton had the best role and the best lines (anyone else detect a little Margaret Thatcher?). And the best scene was probably the 'classroom'. But the film could never decide whether it wanted to be a serious comment on the horrifying consequences of humanity spoiling the environment, or on political dictatorships. Or just a simple, crazy action hero farce with an apocalyptic setting and a simple solution (explosions!). The notion of the train traveling forever at full speed and leaning up on it's wheels as it hurtled round corners and smashed through snowbanks (barely causing it's occupants to notice the g-forces?) made the 'outside' feel even more disconnected from the 'inside', than the poor quality CGI could manage alone. The violence was also over the top and lacking tension - I didn't really care who lived or died. And to cap it all off, the ending was pure cheese. The film would possibly have worked better as a dark comedy - but unlike other over-the-top future satires packed with caricatures (e.g The Fifth Element), the stakes here were played out in all seriousness - leaving you with precious little to really laugh at. Instead, the ending even asked you to "think" with such literal self-importance, that I wondered if the Director was indeed kidding. Still, worth a look, and a film worth talking about. Even if only to lament how much better it could have been. The first 30-40 minutes or so really had me "on board", but after that I was ready to get off at the next stop. I've watched this 5 times now and it is indeed a masterpiece. For me, all the pieces fit together perfectly. The signature Bong comic touches with the insane violence and social commentary. It really does bear a second viewing though. There's a lot of foreshadowing in the first half of the movie that makes the second half become much clearer. Calm down with the fanboy Bong Joon-ho's!! This movie was o.k. Was not epic at all, it had its flaws. I understand there's a huge following for this film, but personally I couldn't make it through the whole thing. A bit tooo hokey and mainstream for me.